May 1, 2010 Dan O. Somehow when I grow up and get “Big”, I want to look like Tom Hanks, and have two Oscars under my belt. Penny Marshall directs this whimsical comedy in which 12-year-old Josh yearns to be a grown-up, and when he makes that wish at a Coney Island fortunetelling machine, he awakens the next morning as a 30-year-old man (Tom Hanks). Josh lands a job at a Manhattan toy company, where his child’s-eye view helps him climb the ranks — but he finds himself pining for all he left behind, despite the attention of a beautiful co-worker (Elizabeth Perkins). There are similar films like this about kids changing bodies with adults. The one film I reviewed awhile back, 17 Again, is basically the reverse of this story, and in the same year a movie just like this one Vice Versa came out. So you would think that this subject material starts to get old after awhile, right? The answer to that question is absolutely not. The best thing about this film that makes it so fresh and such a classic is that its writing is very witty, and realistic. The one-liners in this film work, especially for its comedy side, but even the dramatic side of this film, showing that we all are kids in our lives, and its great to go back to when we were, and just have fun for awhile. There are also a lot fun scenes that mostly are innovative when it comes to showing coming-of-age tales. The romance between Hanks and Perkins is handled carefully, and not all sexxed up, that great scene with Hanks and that old guy playing “Chopsticks” on that ground piano (still got to find that place), and of course having the idea of talking to your next door neighbor through a walkie-talkie (wish I could do that with mine). I loved how they nailed the spot for Tom Hanks in this role. When people talk about Tom Hanks, and his break-through being something like Philadelphia, however, it is really this film that got him noticed. He really embodies how this 12-year old kid, turned older dude would act when put in this situation. He’s funny, sweet, all over the place, and immature, just as you would imagine a kid who turns older would be. The problem with this film is that the ending doesn’t convey too many emotions that it should have done so well with. I think I saw the same run-of-the-mill story done so much it just didn’t effect me so much as it could have, but it still did convey enough for it to be a fun filled ride. 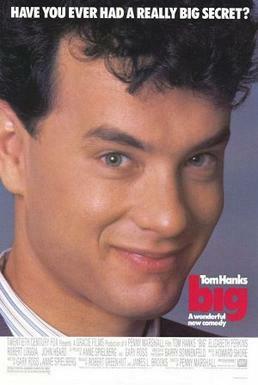 Consensus: Big is a classic that has been done many times, but is exceptional mostly due to the fact that the writing is realistic and funny, with a great Tom Hanks performance early in his career. Ya I really liked this movie as well. In my opinion, the dialogue and jokes werent spot on for me, maybe Im just weird But I thought Hanks was great the way in which he portrayed a kid inside of a grown up person. Ya and that ending, I was hoping for something a little different. It ended kinda flat or somethin. But overall, this was really good.